Hey, guys! 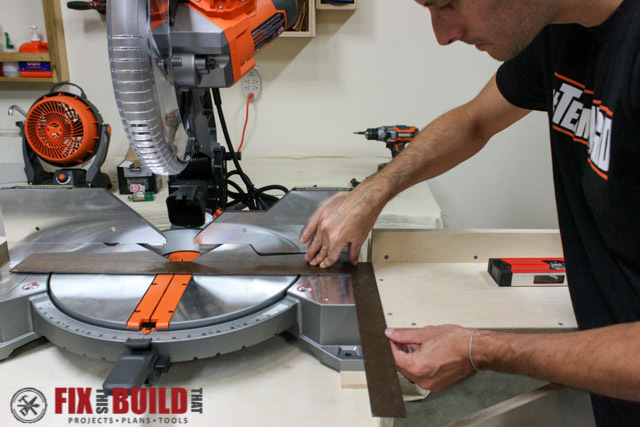 Today I’m covering Part 2 of the Mobile Miter Saw Station build. 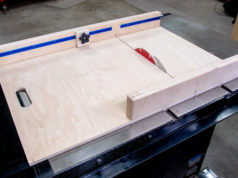 If you haven’t checked out the first post, I’d recommend heading over now and checking it out to see how I built the base and side wing supports. This post will cover the Side Wings, Fences, and Upgrades. 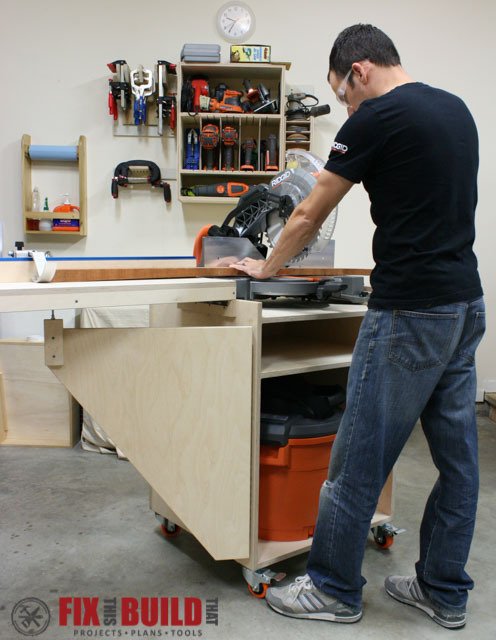 The upgrades to the Mobile Miter Saw Station plan take this build to the next level and it will be a project that will transform how you work in your shop. 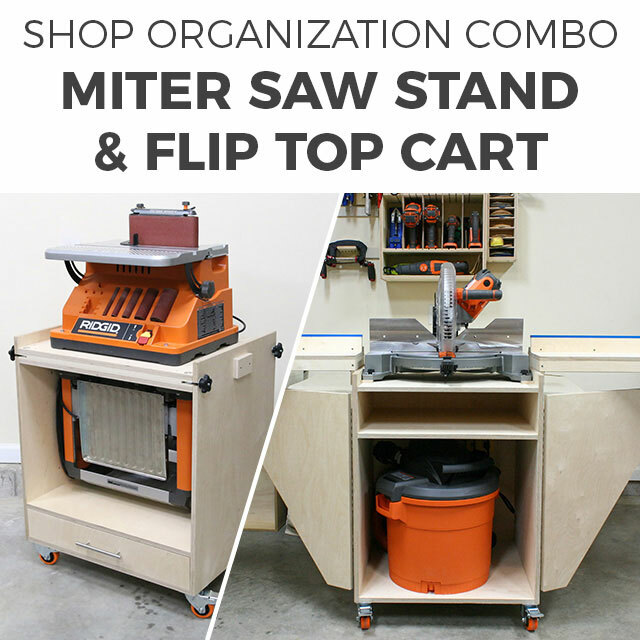 And if you want to get a great deal on two spacing-saving shop plans, check out the Flip Top Tool Stand and Miter Saw Station Combo Plan pack and save 33%! 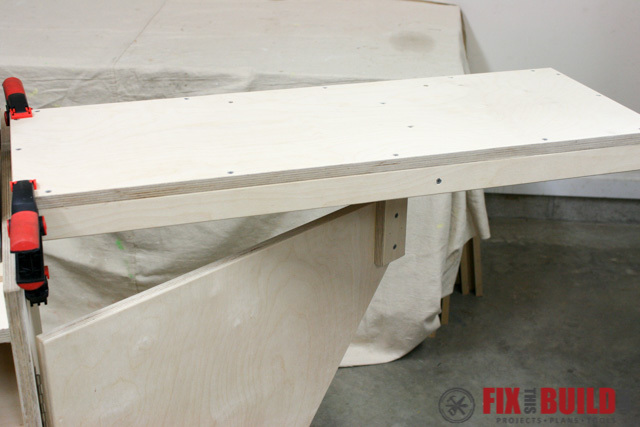 As a reminder, all parts are ¾” plywood unless otherwise noted and screws should be predrilled and countersunk before installing. We’ll pick up after finishing the base and side wing supports. You’ll now make and mount the side wings. Cut two side wing mounting cleats to 12” by 2”. 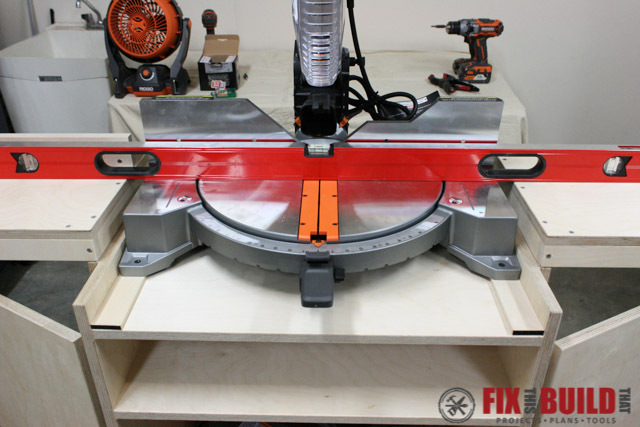 Fasten the cleats to the sides of the base 4” back from the front and flush with the top. (And don’t worry, the side wing supports didn’t disappear, I added this cleat earlier in the build, but it makes more sense here). 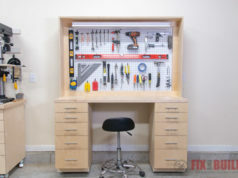 The side wings are made of a 33-½” by 12” top piece and 1-½” wide frame support pieces around the edge with a doubled up support piece underneath. 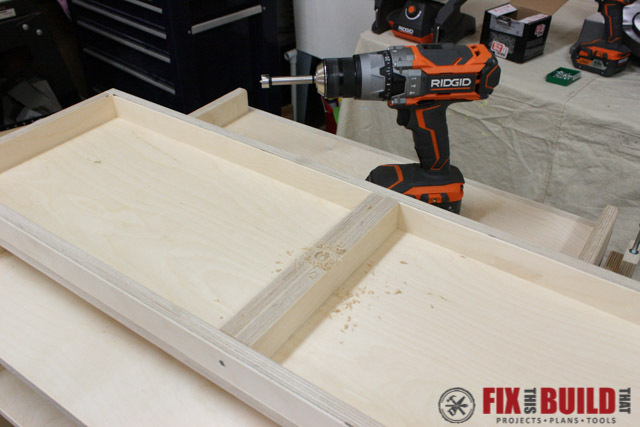 Attach the top to the 33-½” long pieces with 1-¼” screws. 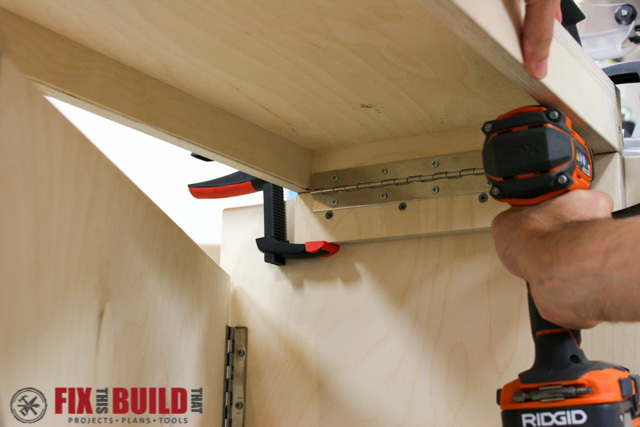 Secure the 10-½” short frame supports on both ends from the top and sides with 1-¼” screws. Glue or screw together two more 10-½” pieces for support blocks. 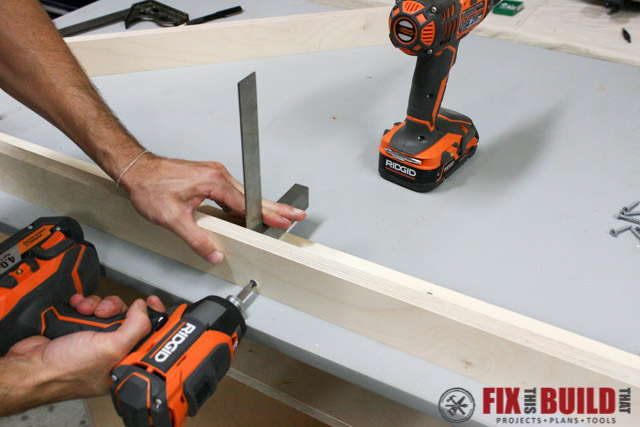 Place the center line between the two boards 20-¼” from the outside edge of the side wing. 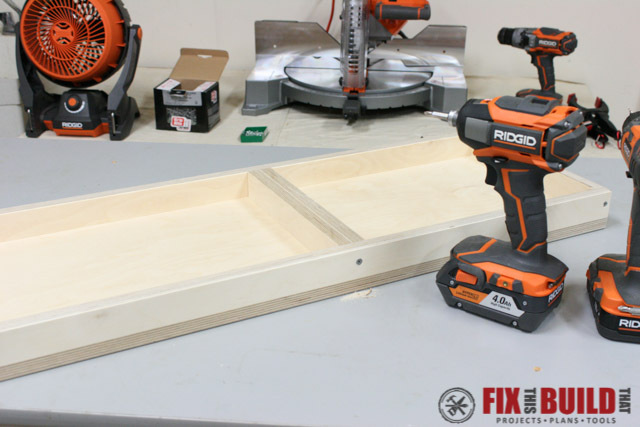 Secure with 1-¼” screws from the top and sides. These supports blocks will rest on the leveling bolts of the support wings. 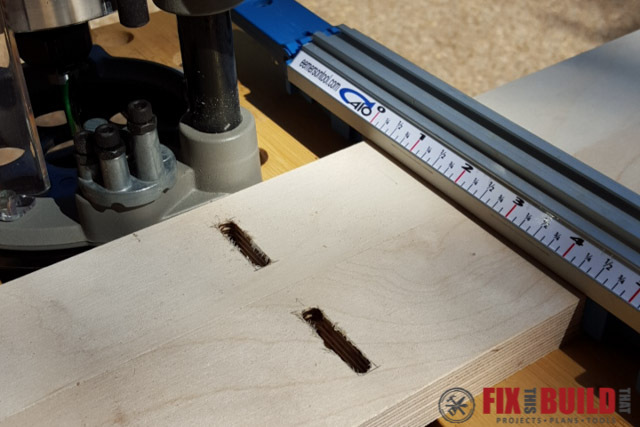 Cut two 10-½” pieces from the 1-½” piano hinge. 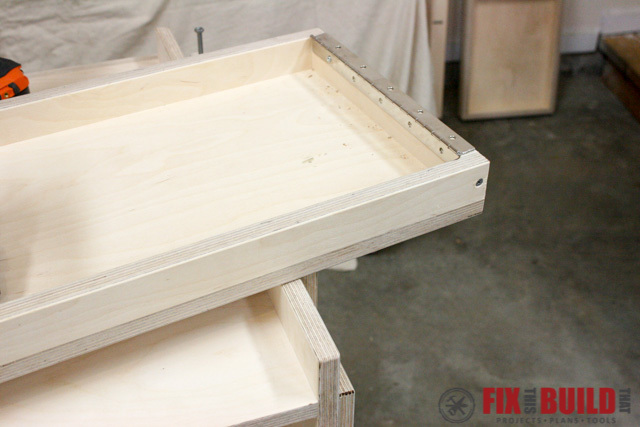 Attach the hinges to the inside face of the short frame. 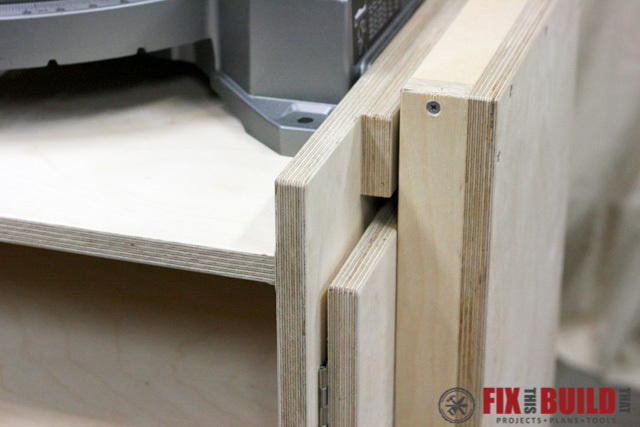 The hinges should be installed on the end furthest from the doubled up support blocks. Test fit the side wings by opening the side wing supports and placing the hinged ends of the side wings on the 12” support cleats and resting the support blocks of the side wings on the leveling bolts. 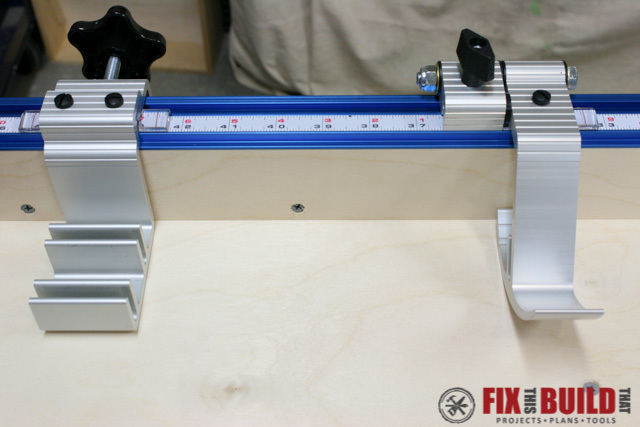 Securely clamp the side wings to the 12” support cleats. From under the side wings, mark where the support bolts are centered on the support blocks of the side wings. 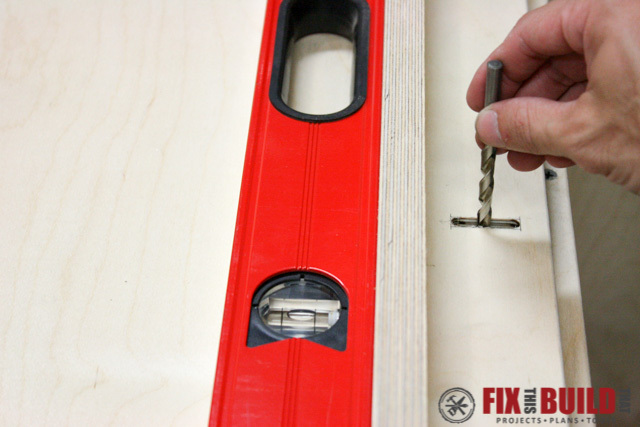 Remove the side wings and, using a flat bottomed bit, drill a ⅝” hole ⅛” deep where you marked. This makes a pocket for the bolts to sit in and keeps the wing supports from moving during use. Put the side wings back on top of the support cleats and wing supports. Clamp in place and from under the side wings, screw the hinges into the support cleats using ⅝” screws. The side wings should now fold into place over the folded support wings. Nice work! Up next is making and installing the fences. 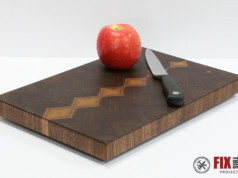 Cut four pieces 33-½” long by 2-¼” wide. 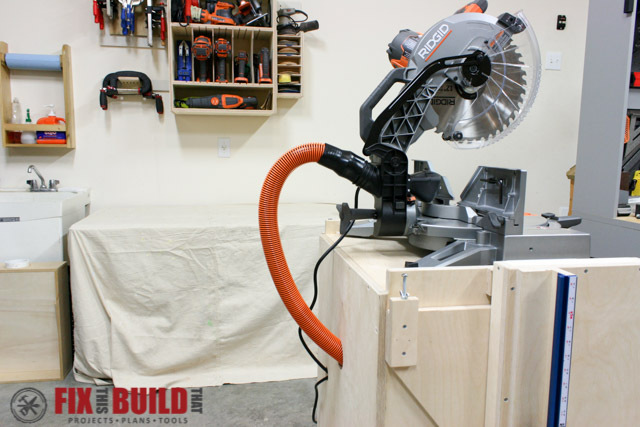 If you want adjustable/removable fences, cut ¼” wide 1-¼” long slots on two pieces before assembly. The slots are 10” from each end and centered front to back. 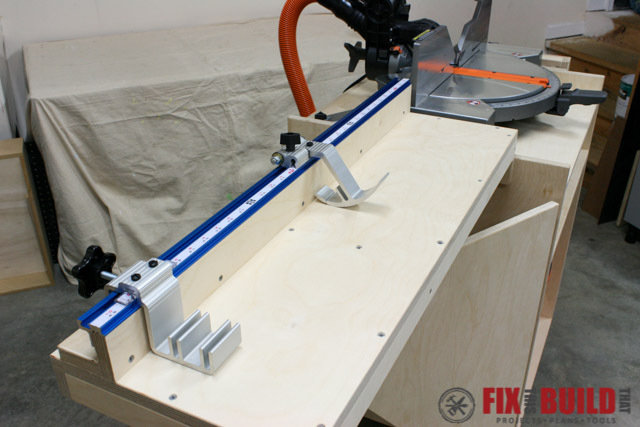 They can be cut with a straight bit in a router or by drilling ¼” holes along the slot and cleaning up the edges of the slot with a chisel. For each fence, lay one board flat and turn another board on it’s edge. 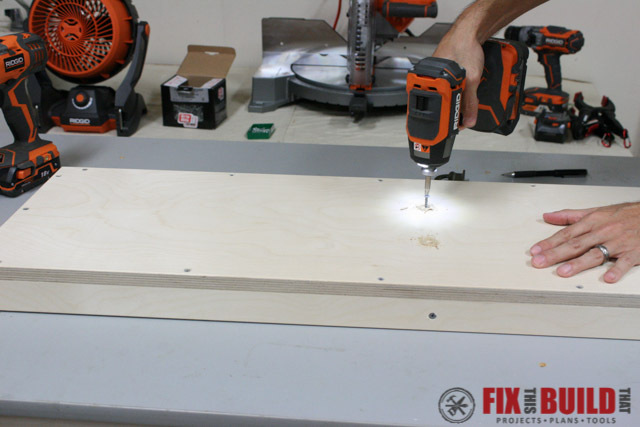 Use a right angle square for reference and fasten the boards together using 1-¼” screws. 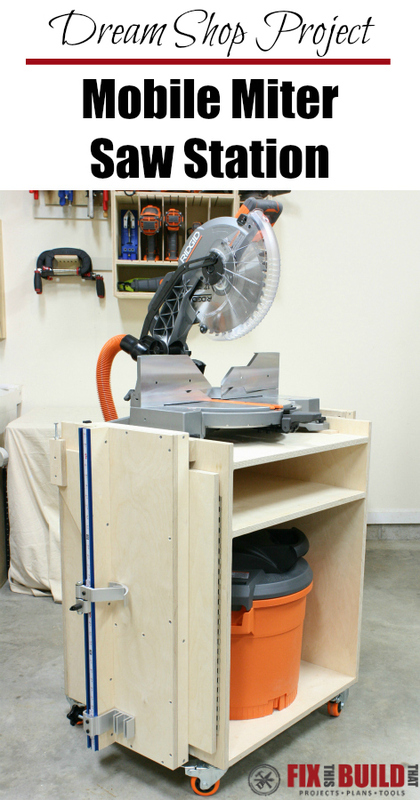 Now put the saw on the base and push it back until it’s even with the back of the base. Extend and the side wings and place a 4’ or longer level across them. 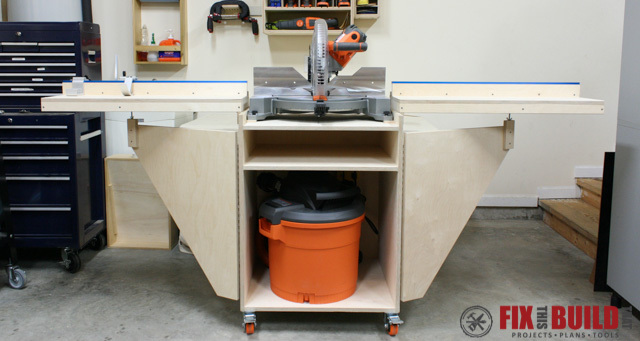 Level the wings and measure the distance from the bottom of the level to the miter saw. 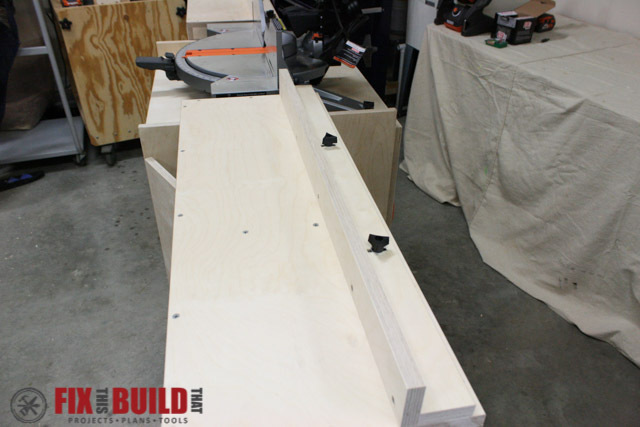 Cut hardwood spacers to raise the miter saw the needed height. My spacers were maple at 5/16” thick, 18-½” long and 1-½ wide. 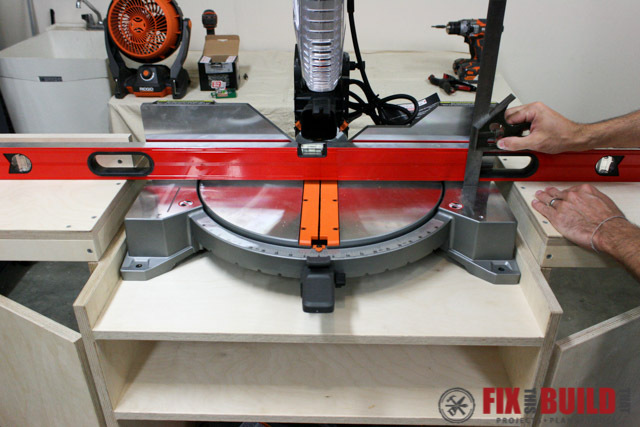 Put the spacers under the feet of the saw. 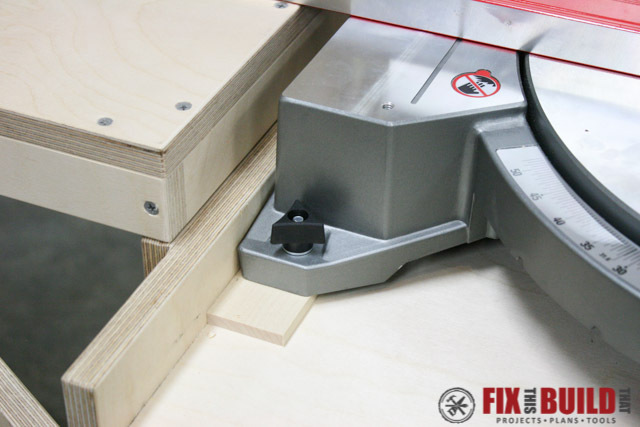 Square the saw to the side wing using a carpenter’s square. I mounted the saw with 2-½” long ¼”-20 bolts, lock washers, fender washers, ¼” washers, and threaded knobs from an INCRA Build-It Knobs 8pc kit I bought online. 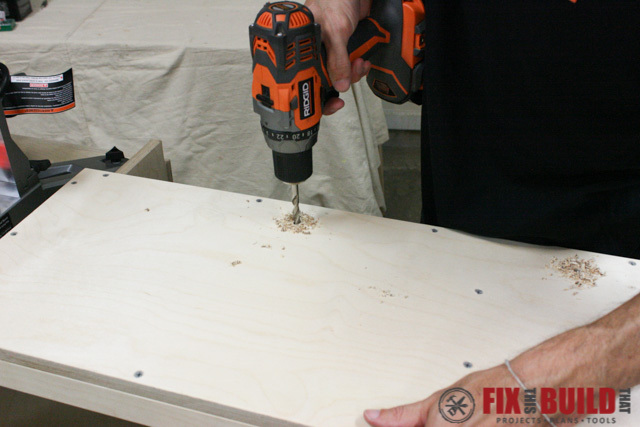 Drill a 5/16” hole through the spacer and top shelf. Put the lock washer and fender washer on the bolt and push it through from below. 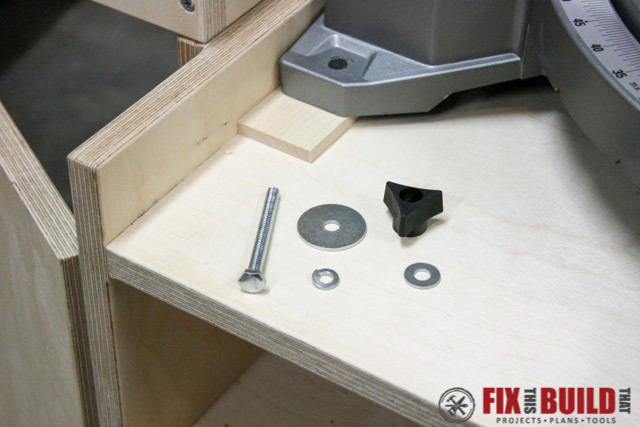 Then put the ¼” washer and knob on the bolt and tighten securely. Repeat on the other 3 corners. 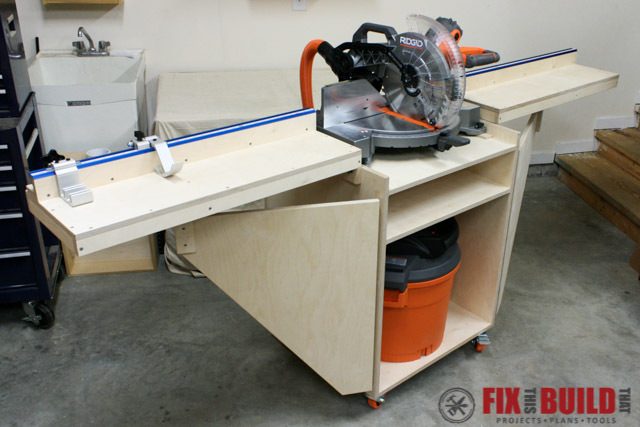 Next align the side wing fences to the miter saw fence with a straight edge. For adjustable fences, clamp the fences down and mark a hole in the center of each slot on the fence. 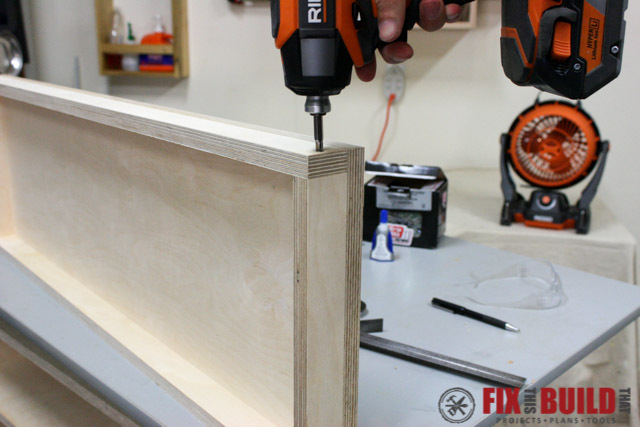 Remove the fences and drill 5/16” holes through the side wings. Replace and realign the fences and use the same bolt and washer combo from above and install the locking knobs. 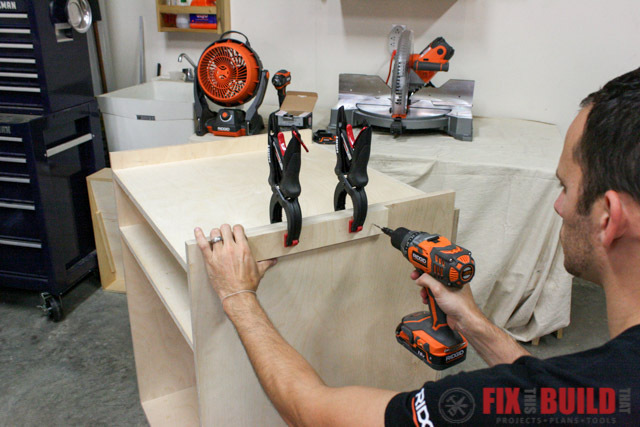 If you are permanently mounting the fence then secure with 1-¼” screws. I added an aftermarket fence stop system from Kreg including a mounting track with adhesive tape measures, a flip stop and stop block. I bought the 4’ track and cut it down to 33-½” vs buying the kit with four 2’ track pieces. Mount and install these per the manufacturer’s guidelines. 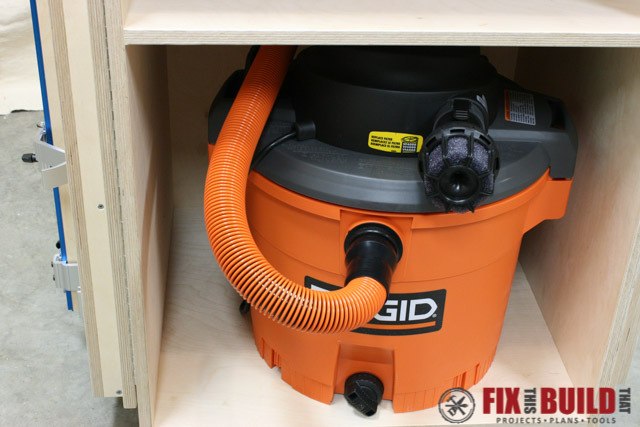 I added dust collection from a RIDGID 12 gallon vacuum with an upgraded VT2570 pro-grade hose, and VT2525 muffler. 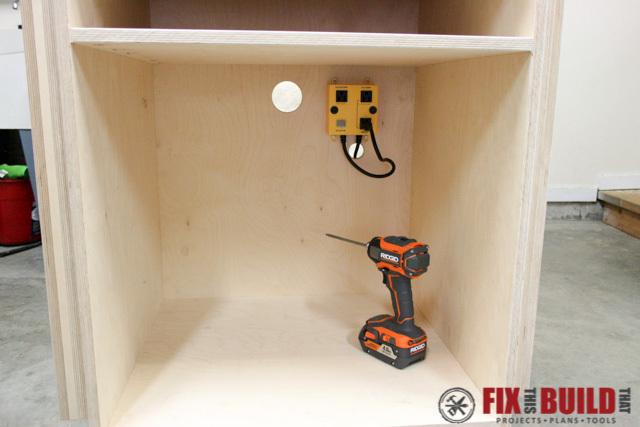 I installed an iVac automated vacuum switch in the back of the cabinet as well. The saw and vacuum are both plugged into the switch which is plugged into the wall or an extension cord. When the saw is turned on the vacuum comes on and continues to run for a couple seconds after the vacuum is turned off to clear the dust. How cool is that!?! I hope you’ve enjoyed the build! 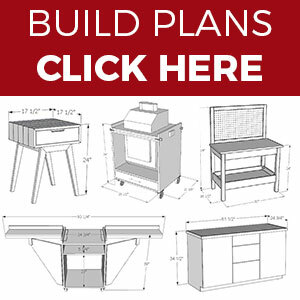 For more great shop project plans head over to my Shop Project gallery. 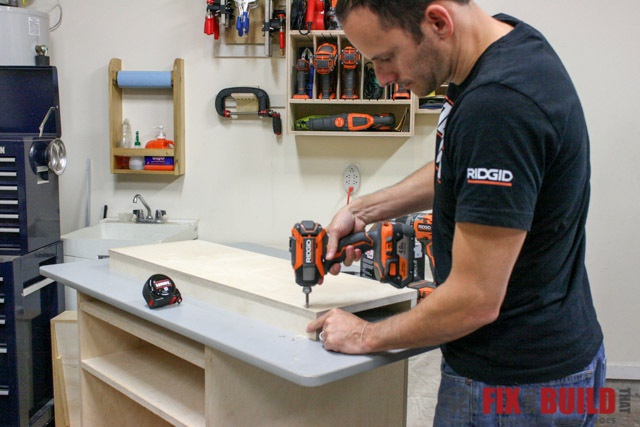 RIDGID provided me with tools and/or monetary compensation as a sponsor of this build. All opinions are my own and are not filtered by the sponsor.